Red Food Week continues on the Fire with shrimp! Yes, shrimp is orange. But when I made the dish, the sauce turned pink because the pickled ginger was a bright red color. Did I mention it was also delicious? The recipe calls for uncooked deveined shrimp. I'm busy Girl, I don't have time to shell and devein the shrimp, so I bought some frozen cooked shrimp and only heated them through to avoid that awful rubbery texture. It worked. I like cellophane noodles. They've made an appearance on the Fire before. They are super easy to cook. Throw a bunch (they're packaged like small individual serving-size nests) into boiling water for 3 minutes then drain. You could also simply serve this over rice too. But the noodles cook up faster! As it is, this dish cooks up super quickly, especially if you use the pre-cooked frozen shrimp. Great for those nights when I'm in the office super late. 1. Cook noodles according to package (usually boil water and then place noodles in water for 3-5 minutes). Drain and transfer to bowl. Add 2 teaspoons sesame oil to noodles and toss. 2. Mix vinegar, cilantro, ginger, jalapenos and honey in small bowl. 3. Heat remaining 2 teaspoons sesame oil in heavy large skillet over medium-high heat. 4. Add green onions and garlic; saute til aromatic, about 2-3 minutes. 6. Dissolve cornstarch in 1/2 cup water. 7. Add mixture to skillet; stir until liquid thinkens, approximately 2 minutes. 8. Mound noodles on platter. 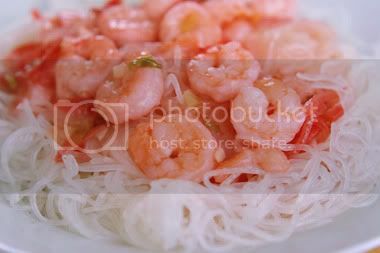 Top with gingered shrimp and serve immediately.